It has been another great year at OpaVote, and we have been working hard to continue to make it work better for you and to introduce new features. We hired a web designer to completely redesign the home page. We love the new design and think it is much better than the old design that you can see here. Below are list some of the more significant improvements that we introduced over the past year. Please let us know what you would like to see in 2017! Tracking of voter activity in your election. OpaVote shows you a graph with the number of email opens, the number of voting page visits, and the number of votes cast on an hourly basis. Detailed reporting of email delivery. OpaVote tells you when emails have been delivered to individual voters. If emails bounce, OpaVote tells you why so you can try to fix it! Much more content about supported voting methods. 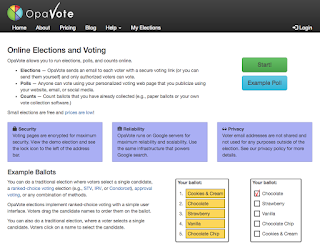 OpaVote supports a lot of voting methods, and we want to help you understand the different options and how they work. See our help menu for more info. OpaVote Counts now support just about all of the features of OpenSTV (which is no longer available). We still need to implement manual tie breaking and expect that feature in the coming year. Free recounts of ballots for all voters. We previously provided ballots to voters, but now your voters can recount them for free using all the methods supported by OpaVote. Better election results page to easily access all relevant information about the election. Detailed results, ballots, and recounts are just a click away. New report types. In addition to seeing the bar charts on the results page, we provide a text report (good for emailing) and a CSV report you can open in any spreadsheet program. A new support forum. This is the place to get your OpaVote questions answered. We now have a poll widget that you can embed on your own website so your voters don't even need to visit OpaVote. We have an example poll widget and instructions for using it. 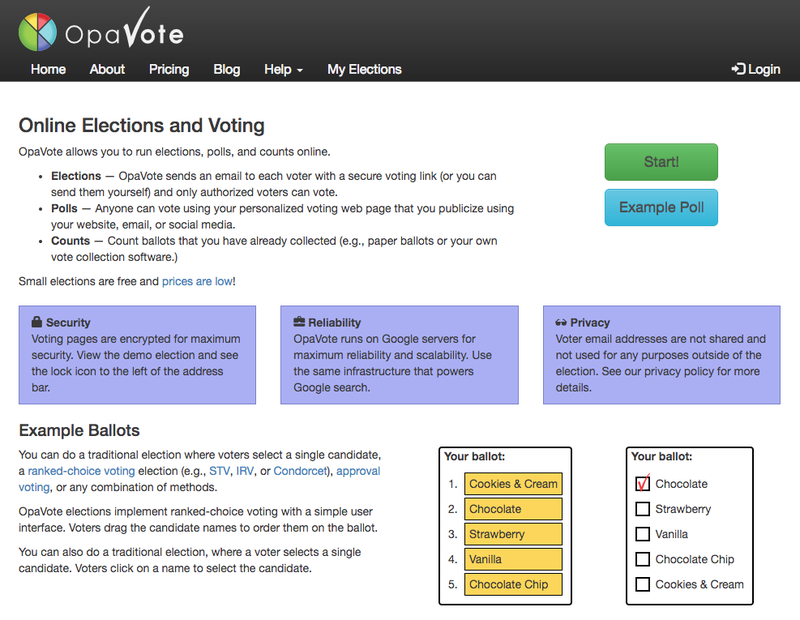 We have a first draft of an API for automating interactions with OpaVote from your own servers. You can use our API to create Counts automatically or obtain information about your election while it is in progress. We added Amazon login in addition to Google, Facebook, and LinkedIn. For your security, we don't store your passwords, and we want to provide login accounts that are convenient for you. Please consider these organizations in making your year end donations. That is our wrap up for 2016, and we are looking forward to a great 2017!